We continually strive to ensure that our clients are able to meet their responsibilities for service provision to end-users. 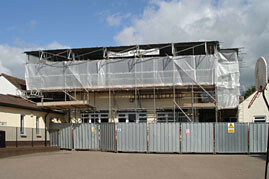 In February 2009 we were asked by our joint venture partners Devon County Council for some urgent help. One of their schools, Willowbank Primary in Cullompton, had been forced to shut down after suffering more than £250,000-worth of damage in an arson attack. The fire was on a Thursday evening, and the following week was a half-term break. We allocated one of our qualified building surveyors to work on re-opening the school as quickly as possible. As we manage the Council’s database of approved contractors, we had instant access to the specialists who would need to undertake the work. We used our relationships with them to negotiate provision of the required services with extremely short lead times. Although the suppliers would be working directly for the school’s insurance company, we arranged with the loss adjuster that we could manage and co-ordinate their activities. This required our extensive presence on-site, to facilitate, communicate, and generate the collaboration between all the parties that would be needed for rapid completion. The first task was to work with the fire service and security sub-contractors to segregate ‘safe’ and ‘unsafe’ areas of the site. We arranged for two temporary mobile classrooms and a mobile toilet block to be delivered to the site. Next, we started an extensive cleaning task to rectify the smoke damage. The classrooms were made comfortably usable with interim repairs to the electrical systems and installaion of portable electric heaters. After nine days of exhausting work from all involved, including working long hours and over the weekends, the school was able to re-open on the Tuesday after half-term. We kept the school appraised of progress throughout. Only two days of teaching were lost, and we were able to achieve this because of our understanding of our partner Devon County Council, and their supply chain. The school’s governors stated how impressed they were with the professionalism of our building surveyor, Chris Haugh.